Progress has been announced in the quest to overcome one of the biggest obstacles to cheap solar power. 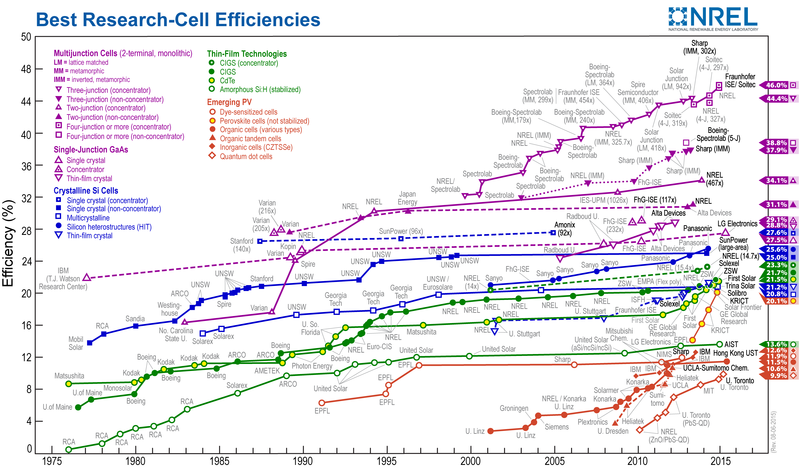 A tandem solar cell exceeding 25 percent efficiency has been proven possible, but the long-run potential is much higher. Perovskite cells have shaken up solar research. They are potentially very cheap to make, and while their efficiency doesn’t yet match the best silicon cells, records have been broken faster than for any previous cell-type, and they show impressive adaptability. The main drawback is their stability – perovskite cells decay in many environments. The paper concludes: “Considering further minor improvements in the perovskite, optical management and integration, and choice of [silicon] rear cell, it is feasible that this system could deliver up to 30 percent efficiency.” Snaith told IFLScience the additional cost should be around 5 percent, for a 20 to 40 percent performance boost. The fact that perovskite’s bandgap can be tuned means there is potential, once the problems of large-scale production have been solved, to pile two perovskite layers with different bandgaps on top of a silicon cell. Efficiencies this high would be a huge boost to solar power wherever space is limited. Even where space is not a restriction, more efficient cells at an only slightly increased cost would reduce installation costs, leaving fossil fuels unable to compete on price, even if environmental effects are ignored.